← A knock on the door…? The Dodo was bouncing in a very straight line, it was looking down and didn’t see them so the creature almost bumped into Ilan and Tenzin. The bird jumped, froze and opened its eyes like two big plates. It stood there for at least 30 seconds, doing nothing, just staring at them. 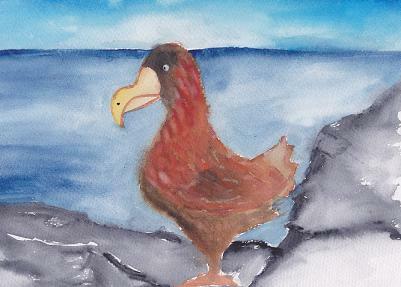 “I think it’s a dodo… you know, they declared them extinct,” Ilan whispered back. Ilan didn’t know what to do, so she touched the bird’s head, softly. Always softly she thought. “I bet the bird can say more tocs…” answered Tenzin and burst out laughing. “Ok, look Ilan, we’re in middle of a desert, paradoxically, in an island that floats and moves around like a rocking boat, and now we’ve just found a strange bird that speaks erm… door language… can you think of a stranger situation? But Tenzin interrupted her “I know what you’re going to say, you’re going to ask him to carry us around!” said Tenzin whilst joking. Sooner said than done, the dodo slipped himself under Ilan and Tenzin and before they could realize they were riding it; the dodo disappeared into the forest. Mika I love your painting and I really like all the creative ways that you have moved your character along. It has been a very exciting ride.